You’re about to write the best cashier resume the hiring manager has ever seen. Amazon is killing malls and brick and mortar stores. Cashier jobs are dwindling like chocolate cupcakes at a toddler’s birthday party. Yet there’s still a ton of cashiers in the labor pool. The manager is sitting back like Caesar on his throne. Meanwhile, hordes of hungry applicants all scream for his attention. Your cashier resume is somewhere at the back. You need to write a resume for cashier jobs that stands out like Wonder Woman in a Nordstrom. A cashier resume example better than 9 out of 10 others. How to write a cashier duties resume that gets more interviews. Tips and examples of how to put skills and achievements on a. How to describe your experience on a resume for a cashier to get any job you want. 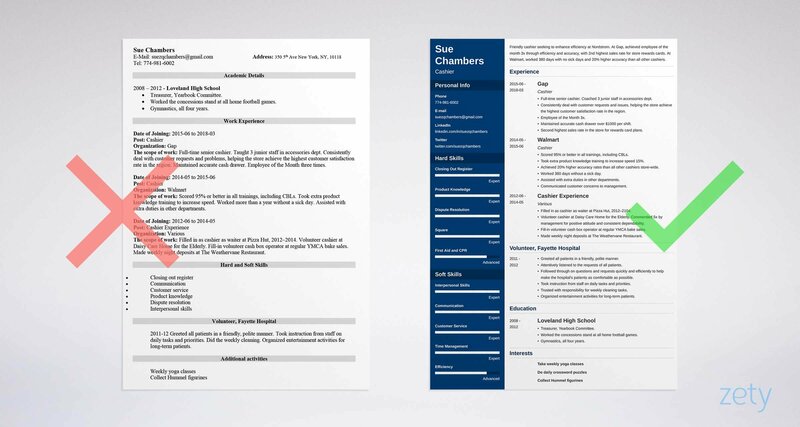 Here's a sample resume for a cashier made using our resume builder. What's the Best Format for a Cashier Resume? Just pick the right retail resume format for cahiers. That’s right. Most retail cashier resumes start off as wrong as Cassey Ho in a Cheesecake Factory. So—launch yours with the chronological format. It’s the best resume for cashiers because it puts your most relevant achievements first. Dress it up with the best fonts for a resume, clear headings, and white space to let it breathe. PDFs stay beautiful after they’re unboxed. Pro Tip: Did we say PDFs are best? Just make sure the job offer doesn’t discount them. If the offer says no PDFs, send your resume for a cashier in Word Doc form. You’re up against 200+ applicants for this cashier job. The hiring manager won’t read most of them. Because you’ll start it with a cashier resume objective or resume summary that hiring managers can’t resist. Write a resume objective if your experience is like store shelves after Black Friday—empty. Use it to show passion. Write a resume summary if you were working cashier jobs back when Gadzooks was still in business. Stock it with your best accomplishments. The two senior cashier duties resume examples below show how. Experienced head cashier seeking a new job. Responsible for all cashier duties at Gap, including taking customer payments, bagging purchases, scheduling, opening and closing cash drawers, and after-shift cleaning. That’s not exactly filing for bankruptcy, but it won’t mob you with interviews. Friendly cashier with 4+ years of experience, seeking to enhance efficiency at Nordstrom. At Gap, achieved employee of the month 3x through efficiency and accuracy, with 2nd highest sales rate for store rewards cards. At Walmart, worked 380 days with no sick days and 20% higher accuracy than all other cashiers. Wow. Everything must go. Those measurable achievements do the job. But what if you don’t have experience? The next two entry-level cashier resume examples have what you’re looking for. Is your cashier experience brand new? Use a cashiering resume objective. But here’s the trick: Don’t just show passion. Add transferable achievements from other jobs or volunteer work. Energetic cashier, skilled in opening and closing. Haven’t worked a cashier job yet, but I’m very eager to learn. Ouch. That’s like coming up $500 short at closing time. Dependable cashier with proven interpersonal skills. Commended 5x by management at Daisy Care Home for the Elderly as volunteer cashier. Filled in as cashier at Pizza Hut. Also worked as volunteer part-time cashier at Goodwill. Boom. Closed out to the penny. Does that come from a head cashier resume? Where did a newbie get that much experience? Pro Tip: Got writer’s block? Here’s the cure: Write your cashier resume summary or objective last. Just build it from the best bits of your cashier’s resume. Her name’s Paula. She’s hiring for that cashier job you really want, at Macy’s or Old Navy. She just picked up your resume. Now—What will convince her to hire you? But not just any experience. You need just the right 3-5 resume bullet points that fit the job. Follow the professional cashier supervisor resume example below. Full-time senior cashier. Coached 3 junior staff in accessories dept. Efficiently solved customer requests and issues, helping the store achieve the highest customer satisfaction rate in the region. Employee of the Month 3x. Second highest sales rate in the store for rewards card plans. The hiring manager would have to be sold out of brain cells not to hire you. That excellent cashiering resume just convinced her of your skills. Consistently dealt with customer requests and issues. Responsible for selling store rewards card plans. Opened and closed depending on my schedule. That's the cashier clerk resume equivalent of a standee asking for a job. Sure, you handled cashier responsibilities. But how well? Just follow these two entry-level cashier resume examples. Don’t think you don’t have enough cashier experience to get the job. You either do, or you can get some fast. Handled a cash drawer briefly at a non-cashier job? Handled money in a past job? Volunteered collecting money at a bake sale or event? Add those to your cashier associate resume. It’ll stand out like Rihanna at a Forever 21. The next two entry-level cashier duties resume samples nail it. Would you want the first of these two cashiering resume examples? Cashier Experience: No real-world cashier experience yet, but I’m ready to start! Filled in as cashier as waiter at Pizza Hut, 2012–2104. Volunteer cashier at Daisy Care Home for the Elderly. Commended 5x by management for positive attitude and dependability. Fill-in volunteer cash box operator at regular YMCA bake sales. Made weekly night deposits at The Weathervane Restaurant. Wow. Would you like that gift-wrapped? Don’t have cashier achievements in your past? Get some. Volunteer to run the cash box at a bake sale. Do a few hours at your local Goodwill store. Any cashier experience at all is better than an empty drawer. Pro Tip: Don’t show every accomplishment you’ve got in stock. Focus on achievements that match what’s listed in the job offer. Who needs an education, right? This is a cashier clerk resume, not an application for a job at SpaceX. No, you don’t need education for the best cashier jobs. But think of it as a display case for reasons to hire you. Let me show you what I mean in two more cashier resume examples. Then add accomplishments that fit the job. Worked the concessions stand at all home football games. What a selection. I guarantee the hiring manager is interested. Whoops. I want a refund. A resume for cashiers without details need serious restocking. Pro Tip: Should you list your GPA in a resume for a cashier? Only if it’s impressive. Otherwise, use the space for eye-catching accomplishments. What’s the biggest mistake on most cashiering resumes? They’re also usually the wrong skills. It’s easy to outdo the other applicants. These retail cashier resume examples show what I mean. Remember Paula, our hiring manager? Cashier Skills: (1) Product knowledge (2) accuracy (3) dependability. A hirable cashier associate resume doesn’t just toss a lot of skills into a bargain basement bin and cross its fingers. You need to pay attention to the job ad. Took extra (1) product knowledge training to increase speed 15%. Achieved 20% higher (2) accuracy rates than all other cashiers store-wide. Worked (3) 380 days without a sick day. Do that with your professional resume for cashiers. The interviews will roll in like bargain hunters after Christmas. Need a boost? Use the cashier duties resume skills below. This cashier job skills list will get you started. The skills on it make great resume keywords for cashiering resumes. Find other skills in online job descriptions. Use that plan and your resume for cashier jobs will hit the Target every time. Pro Tip: The skills of a cashier aren’t all basic math and product knowledge. List soft skills in your cashier assistant resume too. Maybe you’re not applying for cashier jobs. Maybe you’re moving on from them? If so, you’ll need a good cashier resume description. A way to list cashier on resumes that works for getting other jobs. That means cashier responsibilities that follow you to your next job. Knowing how to put cashier on resumes isn’t rocket science. Read the new job offer closely. Find the skills and qualities it’s looking for. Let’s say you’re going for a data entry position. Rated store’s most efficient cashier thanks to fast 10-key typing speeds. Used MS Office skills to generate nightly reports. Leveraged time management skills to create extra time for cleaning. Do that, and you won’t need another word for cashier on a resume. Pro Tip: References don’t make good extras for a cashier duties resume. Why not? If employers want references, they know they can always ask. If you’re with me so far, congratulations. You’re in the top 25% of all the cashier resumes. Now let’s put you in the 1%. To do it, we’ll eavesdrop on our hiring manager, Paula. But how to show that on a resume for cashier jobs??? It’s all down to the “other” resume sections. The cashier duties resume samples below will start you off. Hey, hobbies are great. But do those make you a better cashier? The bullet points below do. Greeted all patients in a friendly, polite manner. Attentively listened to the requests of all patients. Followed through on questions and requests quickly and efficiently to help make patients as comfortable as possible. Who wouldn’t hire that candidate? Even the crossword puzzles show attention to detail—an important cashier skill. Yet if you stop and think, you probably have a ton of extras like that in your work history already. Pro Tip: Volunteer work makes an excellent add-on for a resume for cashier jobs. It’s even better if it’s relevant to register work. What About a Cover Letter for Cashier Jobs? A cashier cover letter? Seriously? But what about a letter that makes her read your cashier resume with extra care? It’s not hard to write that kind of cover letter for cashier work. Just make it personal and passionate. Use the hiring manager’s name if you can find it. Do a little digging to understand the needs of the position. Show you understand those needs. List a big achievement that proves how you will help. I’ve wanted to work at Nordstrom since I first became a cashier, mostly because of your high marks from employees, but also because of your high customer ratings. At a store like Nordstrom, I’d be able to put my accuracy to work (20% higher than any other Walmart cashier storewide) and my dedication (Employee of the Month 3x at Gap). End your cover letter with an offer. For example? “I’d love to show you how I got the second highest sales rate for rewards card plans at Gap." Pro Tip: Don't be afraid to follow up on your resume & cover letter for cashier jobs. A follow-up at the right time can put you top of mind and get the interview. But here are three tips that will flood your inbox with interview requests. First, what’s a professional email address? It’s your first and last name, with a respected domain such as gmail. No KimKardashianFan3983@hotmail.com. Third, have a LinkedIn profile. Why? Because 87% of recruiters hire from LinkedIn. Pro Tip: Don’t have a great LinkedIn profile? Get one. Use our guide to creating a job-getting LinkedIn profile now. Write an eye-catching cashier resume objective. Stuff it with 2–3 eye-catching achievements to snag the hiring manager’s attention. Pay attention to the job description. It tells you what it’s shopping for. Find accomplishments from your cashier experience to match. Add other sections. A great resume for cashier jobs goes beyond just experience and skills. Add volunteer work or even hobbies..
Write a cover letter for cashier job applications. Yes, a cover letter. Just make sure it’s passionate and personal. Do you have questions on how to write a great resume for a cashier? Not sure how to describe your skills or achievements? Give us a shout in the comments! Let's get the conversation rolling. 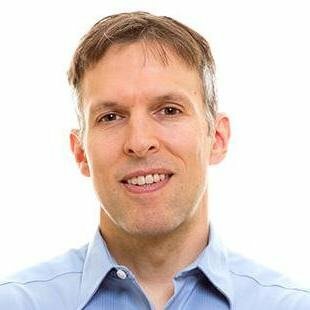 Tom Gerencer is a career expert who has published over 200 in-depth articles on Zety. Since 2016, he has been sharing advice on all things recruitment from writing winning resumes and cover letters to getting a promotion. A complete guide to writing a student resume. Writing a high school resume, a college student resume, or a graduate resume for a first job? 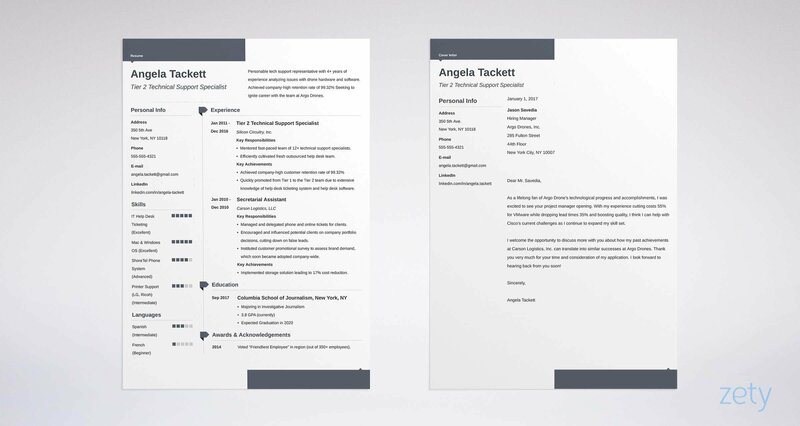 See the best student resume samples and use them today! In no time, you're going to have a resume for students better than 9 out of 10 others. Read more and land your next job! A list of common job interview questions and answers—right and wrong—with expert tips. Behavioral interview questions, phone interview questions, and more. Use our 2, 5, and 30-minute resume writing tips to quickly improve your resume. Actionable examples included. Read more!